Go ahead and chalk up batteries as the latest, coolest thing you can 3D-print. Researchers at Harvard University and the University of Illinois have developed the world's first 3D-printed battery that happens to be less than one millimeter wide. For the sake of context, that's smaller than a grain of sand. Despite its diminutive size, the research team says it still packs plenty of power. Meanwhile, the customizable 3D printing-based fabrication method could allow manufacturers to fashion batteries into a variety of shapes for devices large or small. To create the batteries, the scientists developed a custom 3D printer with a nozzle that measures 30 microns across. The researchers also developed special inks laced with two different types of nanoparticles made from lithium metal oxide compounds to act as the battery's anode and cathode. The printer extrudes these two electrical inks into an arrangement of interlocking combs. After that, the scientist packaged the 3D printed electrodes into a tiny container filled with an electrolyte solution to complete the battery. 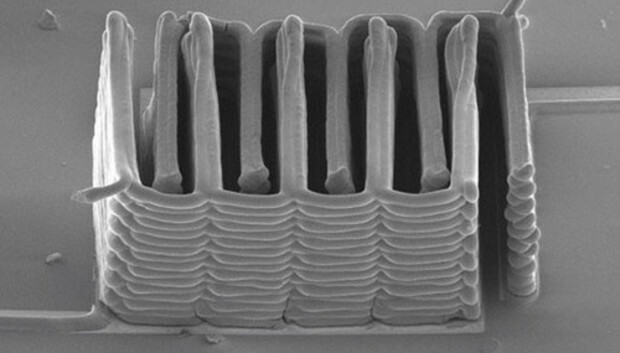 Typically, creating a miniaturized battery such as this requires depositing thin films of solid materials to build the electrodes. Unfortunately, these sort of solid-state micro-batteries do not pack enough energy to power even our tinniest devices. 3D-printing the battery, though, allows the researchers to create stacks of tightly interlaced, ultra-thin electrodes that can hold more energy. "The electrochemical performance is comparable to commercial batteries in terms of charge and discharge rate, cycle life and energy densities," Shen Dillon, an Assistant Professor of Materials Science and Engineering at the University of Illinois, said in a release. "We're just able to achieve this on a much smaller scale." The researchers say their 3D-printed microbatteries could be used to better power miniaturized devices including "medical implants, flying insect-like robots, and tiny cameras and microphones that fit on a pair of glasses." So maybe Google Glass will have some better battery life in the near future.